On New Years Day, I kicked off 2018 by musing about one of the most mysterious men to ever don the Chicago Cubs uniform... maybe even the uniform of any Major League club. 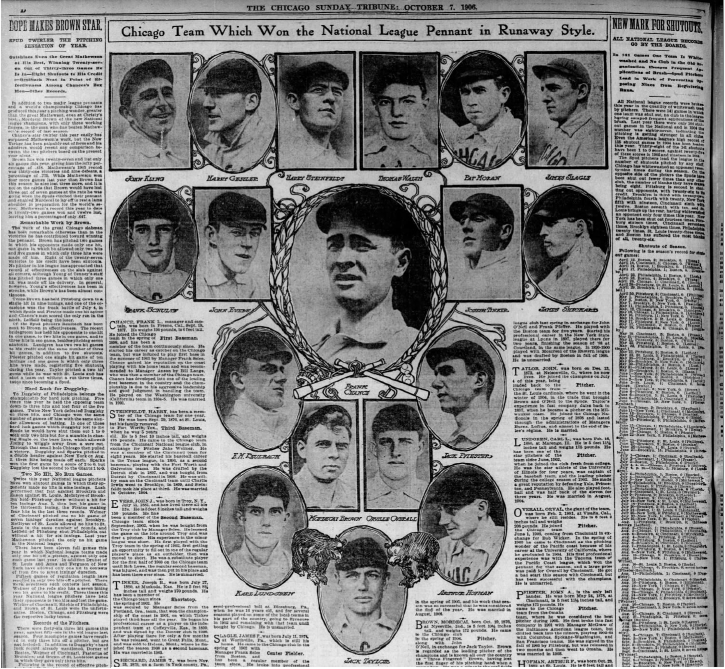 To recap, a man by the name of Tom Walsh appeared in two games during the late summer months of 1906, while the Cubbies were on their way to a still-standing, single-season record 116 victories. 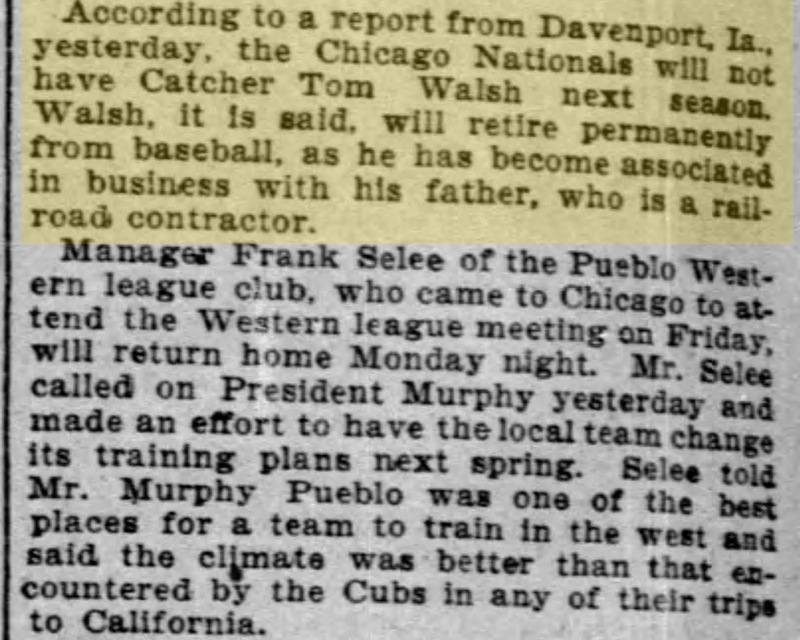 The strange thing about the cameo Cub was that, before or after his cuppacoffee, Mr. Walsh never appeared in another professional contest... not in the majors, not in the minors, not in the independents. Nothing. Where did he come from, where did he go? 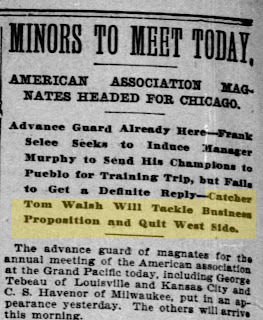 Where did he come from, Thomas Walsh? During my winter break research, the internet wasn't too helpful. 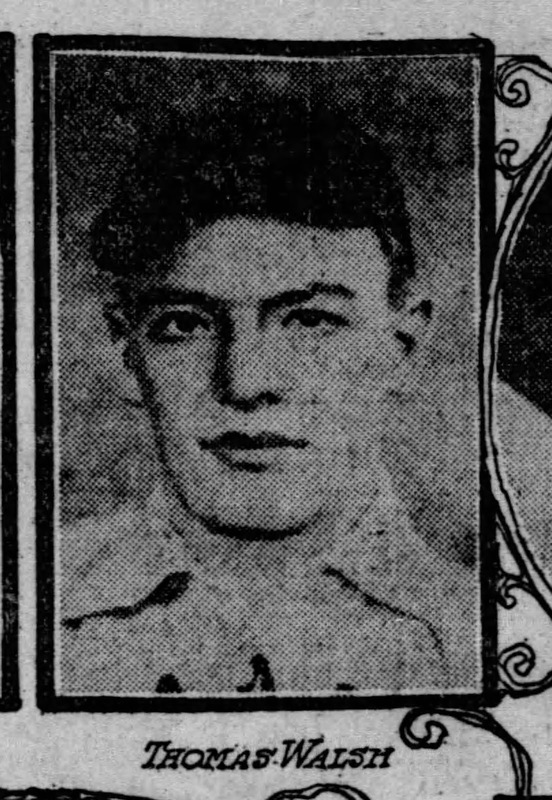 The various online databases didn't have any info on the mysterious ballplayer, other than his vitals, nor did they have contemporary box scores from the early 20th century. Further complicating matters was that the archives of the Chicago Tribune are behind a paywall and, obsessive as I am, I wasn't willing to drop the dinero. 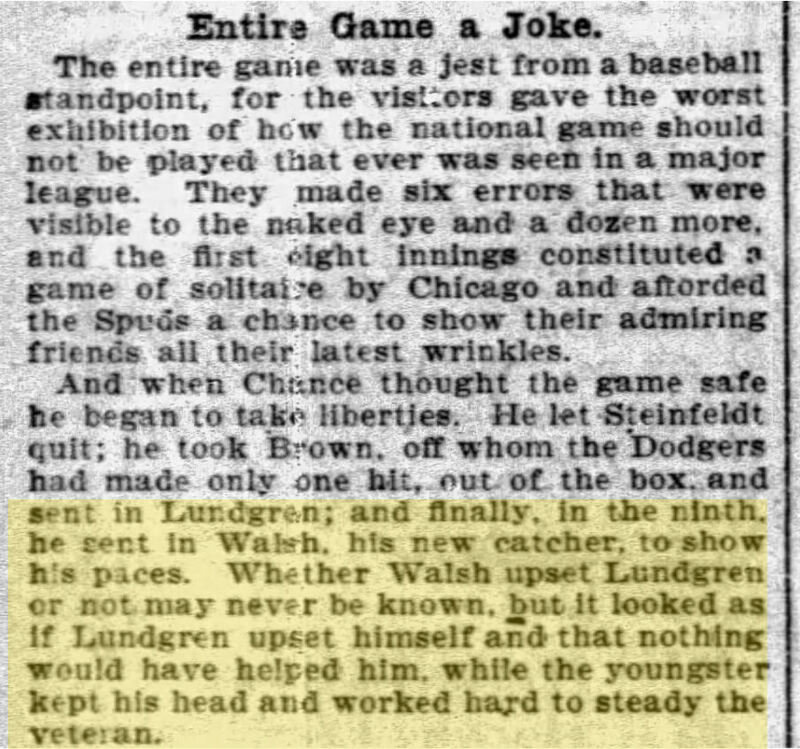 I was hoping to be able to clarify the circumstances behind Walsh's odd career, but no dice. However, there was a guardian angel perched on my shoulder and I didn't even know it. 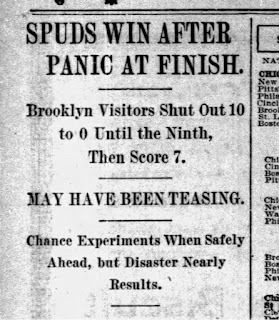 As the picture which leads off the post might indicate, I was able to eventually get my eyes on newspapers from that historic 1906 season. No, I didn't open my wallet (that's still quite light thanks to holiday shopping) - Peter (from Baseball Every Night) did some digging on my behalf and without prompt. What a guy! 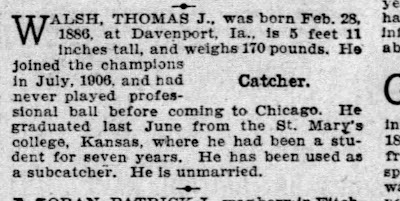 They sure were fascinated by the marital status of baseballers in those days, huh? 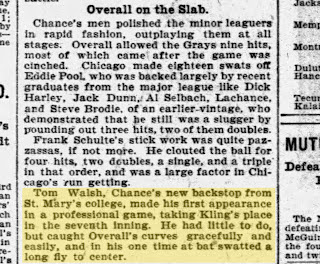 At any rate, the St. Mary's College alumni never appeared in a pro game before his Cubs career because he signed almost straight out of school. 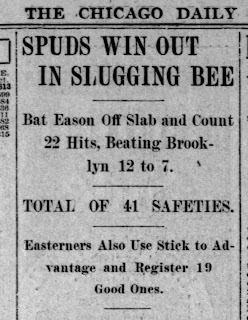 You don't see this sort of thing very often in the modern days; but, back when the minor leagues were their own entities and not just a farm system for the Bigs, it wasn't such a rarity. 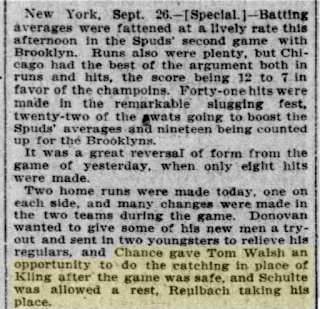 Although no one knew it at the time, this September 26th appearance would be the last time Tom Walsh would ever again take the field. 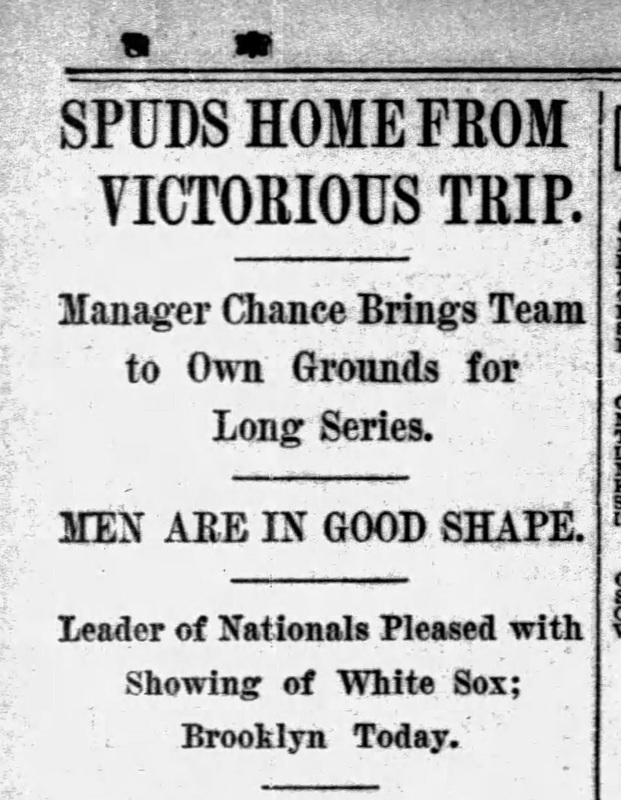 *Sidenote* Though it was quite common across the baseball landscape for the periodicals of the time to bestow their own monikers upon local nines, why the Chicago Daily News chose the nickname of "Spuds" for the Chicago National League Ballclub, I have no idea. 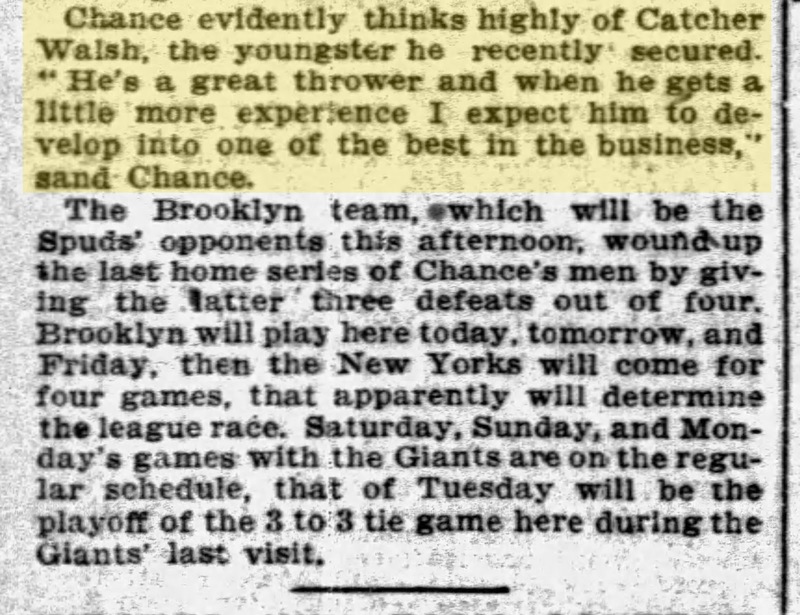 "Cubs" had entered the lexicon, in an article of their own publication, back in 1902; but, apparently it was not yet standardized. 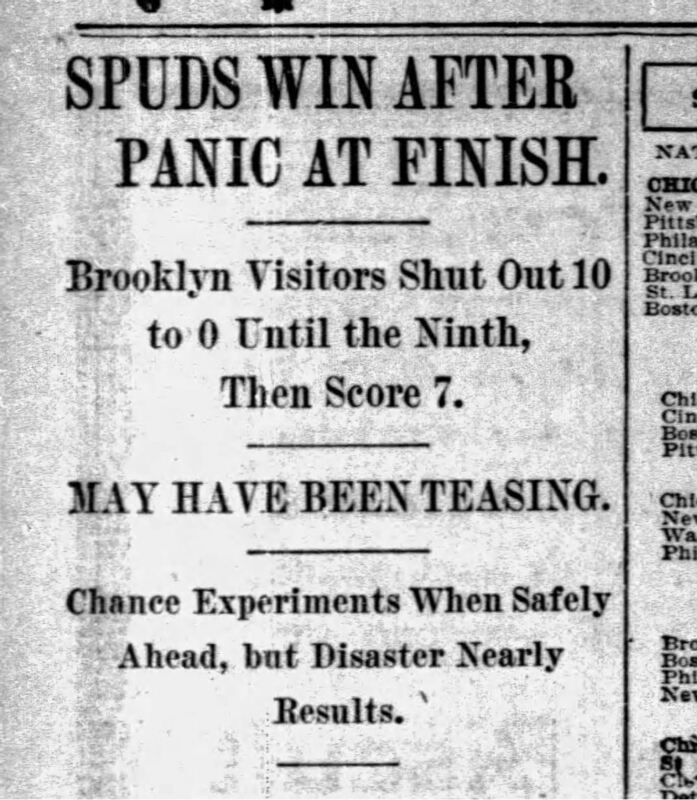 Since 1869, the team has also been known as the White Stockings, Remnants, Orphans, Zephyrs, Microbes, and Colts. 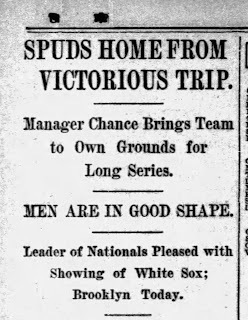 Anyway, I would love to know the origin of their starchy sobriquet. 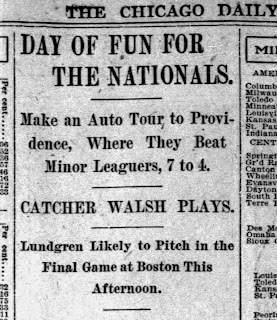 Again, Walsh makes the sub-heading - apparently, his grooming was of some interest during the time. 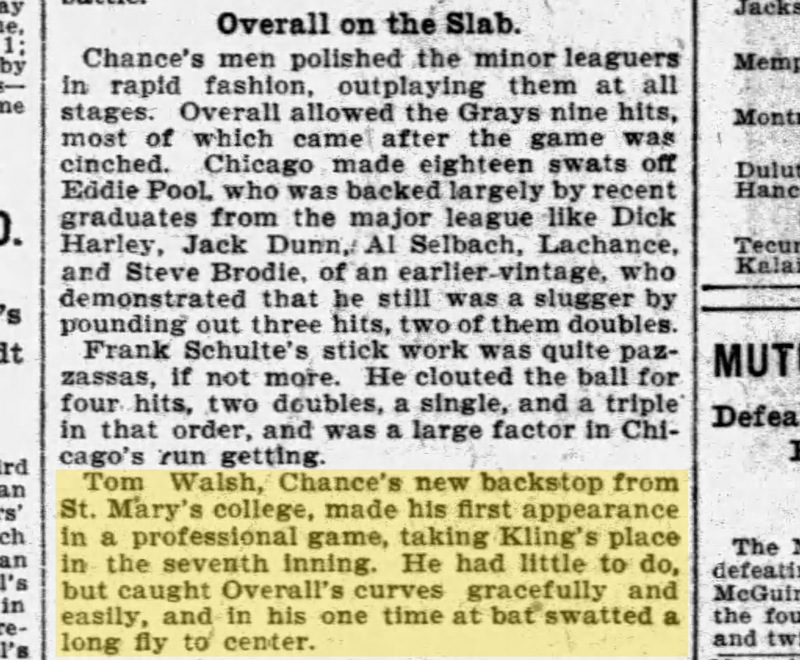 Also, remember, this was the pre-Wrigley Field era, when the Cubs played on the West Side of the city. 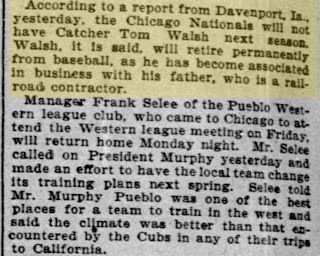 Thanks to this December 30th write-up, we now understand why Tom Walsh disappeared from the baseball landscape so suddenly, he decided to go into the railroad business with his father. 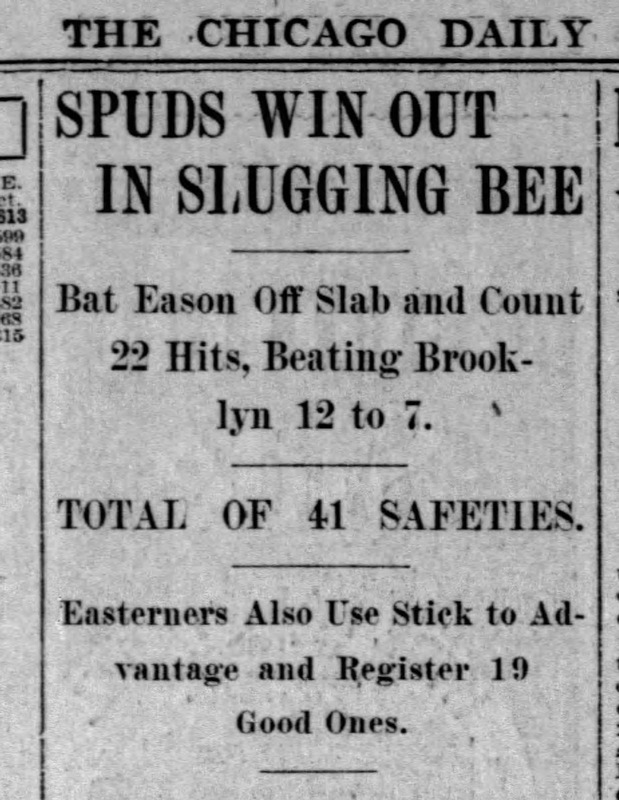 How successful he was in that endeavor remains a mystery; but, at least we now know what became of the would-be backstop. 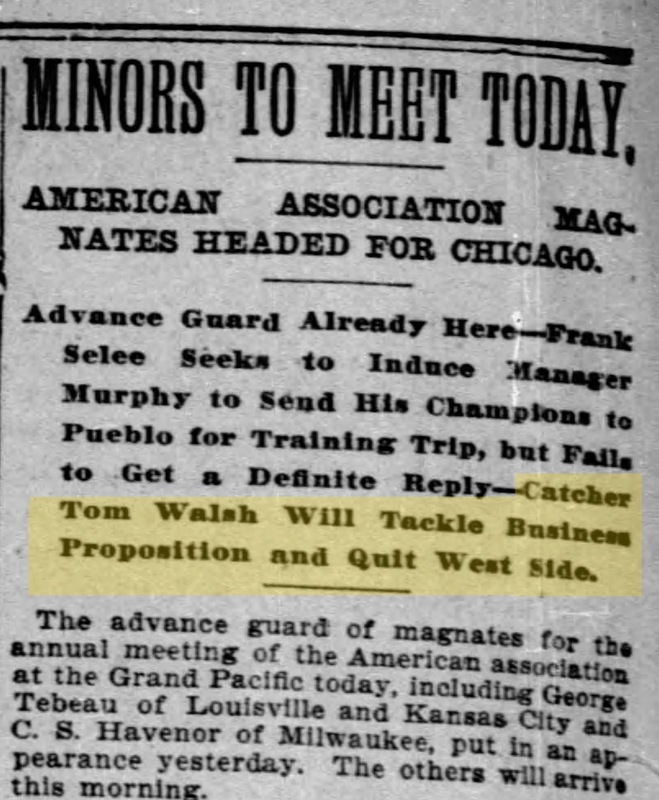 With that, we've filled in most of the gaps from the mysterious tale of Tom Walsh - he was signed straight out college, rode the pine for months and played mostly in exhibitions as he studied the game, made his two, lone MLB appearances during garbage time, and then promptly and permanently retired from the national pastime in order to make it in the lucrative railroad industry. In those pre-air travel days, when the automobile was still in it's infancy, railroad tycoons loomed large in our country and were the kings of commerce. 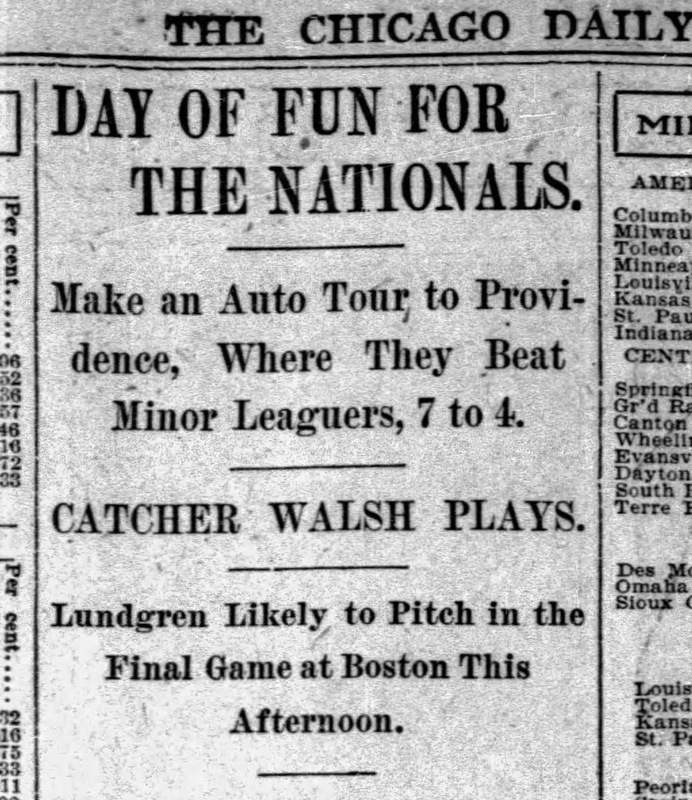 There's little doubt that making it in that business would be much more lucrative for a young, educated man than playing for peanuts in baseball. Seeing as he already had an "in" with trains, I can't say I blame him for making that decision. And, again, we now know all of this thanks to Peter and his tireless research on Newspapers.com, with which he has an account. Thank you, Pete! Since no baseball card blog post is complete without the inclusion of at least one baseball card, here's the post card that pulled both Pete and I down the rabbit hole. 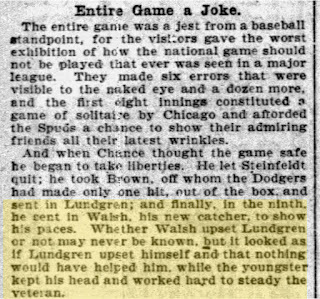 I thought it was strange that a two-game wonder should make the team photograph; but, as we learned, Walsh was actually with the team throughout the summer and fall, despite his sporadic appearances. It all makes so much more sense now. After putting in much more thought on the matter than any grown man should and listening to everyone weigh in on the original post, I've decided to include this reprinted postcard in my marquee Cubs All-Time Roster Collection as representation for the man of the hour. Most agreed with me that it's the best pictorial rep that can be acquired (obviously, his blink and you missed it career did not earn him solo pasteboard recognition) and so it is therefore an appropriate selection, in this particular case. 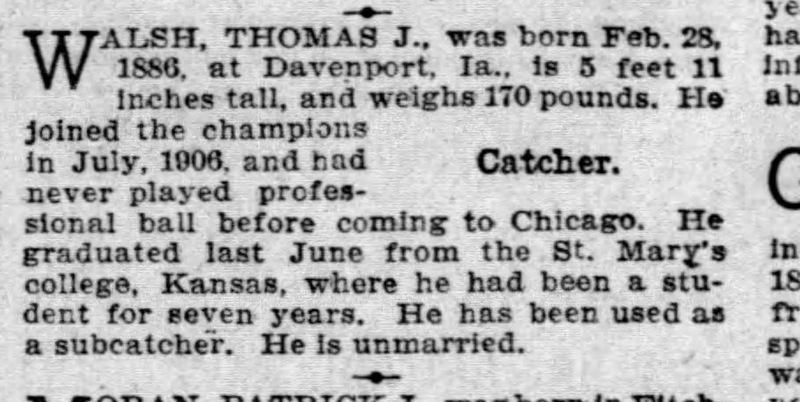 With that, it's been a long time coming - more than two years and hours of research by two different baseball card bloggers - but, welcome to the CATRC collection, Tom Walsh! That was fascinating. It makes you wonder how many other how many other forgotten players are out there waiting to have their stories rediscovered. 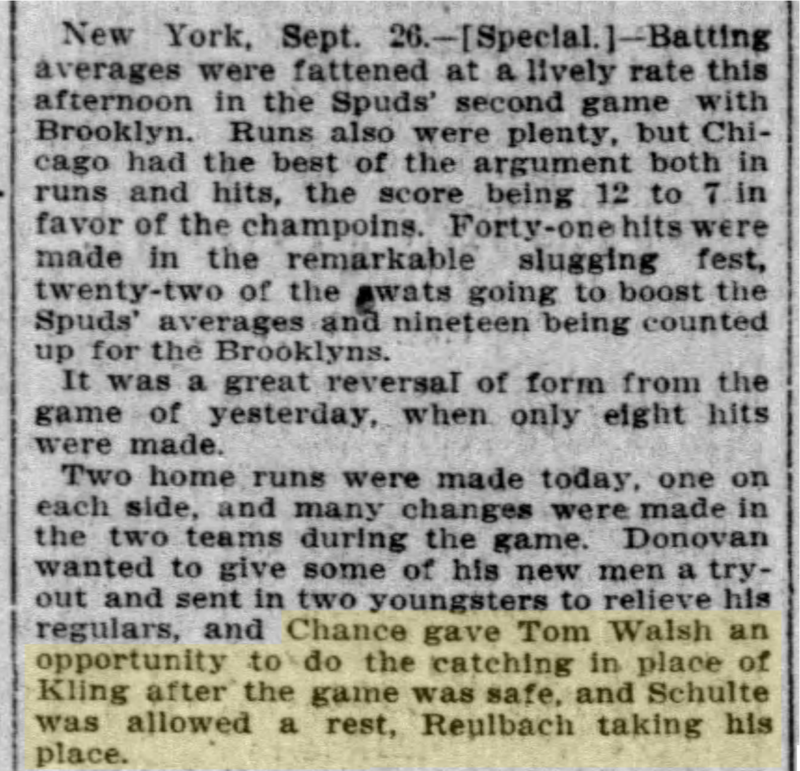 Here's to Tom Walsh and his major league career! Love these sort of posts. Great job by Peter and you. 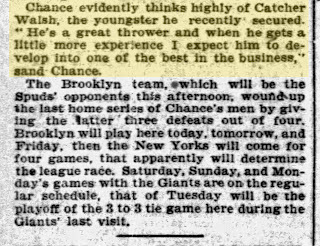 I wonder what became of his business venture with his father and if he had any regrets about leaving baseball so quickly. The link doesn't appear to be working. My interest is piqued though! I wonder if Bryce Harper is going to retire and work in the railroad business. Boy have times changed. Props to both you and Peter for figuring out the mystery. But did he ever get married?!?! Great post and follow up. Well done!